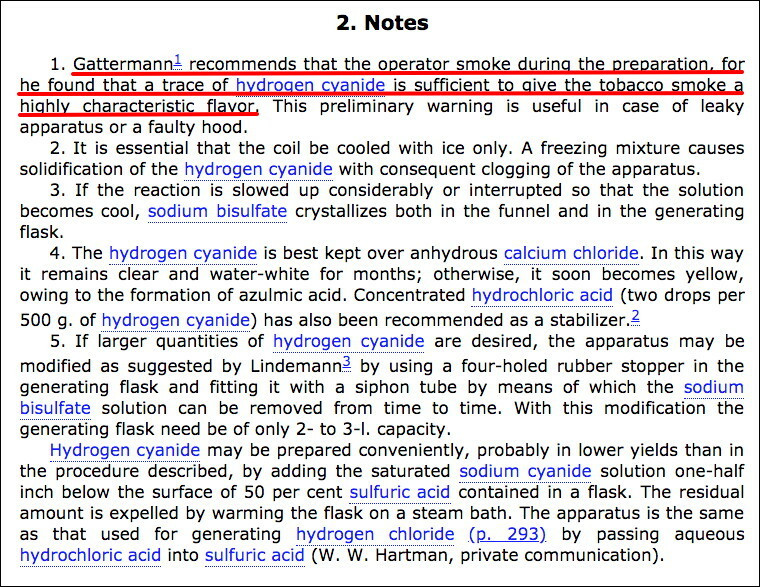 1927 hydrogen cyanide preparation, with a rare advisory to smoke cigarettes during the procedure, as a warning of leaky apparatus. That said I've had my fair share of 'Fun with Faulty Hoods' back in my days as a working chemist. Another time, my boss was working with a selenium compound that carried a BIG warning about 'EXTREME STENCH! Characteristic odor of rotting radishes.' (pretty sure it was this one https://blogs.sciencemag.org/pipelin...h_selenophenol ) similar to my experience (this was in a different facility) the wind that day drove the exhaust from our hood right inot the building air intake. Within minutes everyone was trying to get out of the building while avoiding puking, with varied success. The only reason it was not as bad as it could have been was that he was working after hours, so about 80% of the normal population had gone for the day. Last edited by bruce.desertrat; 04-17-2019 at 06:42 PM. Have not smoked for over 40 years, but reading this I do remember the smoke having a distinctive different taste at times. Being chemically dysfunctional I never put the two together, but it does bring back memories.